Every year, a day after diwali, Kayastha’s all over the world celebrate Chitragupta puja. This festival is also known as Dawaat puja. It is believed that byy doing this puja, devotees will be benefited as Chitragupta god keeps the record of good and evil deeds of every person. Onthe basis of these records a man fate is decided whether he will ascend to heaven or hell. 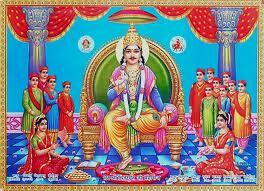 So worshipping the Lord Chitragupta pleases him and the person is surely benefited. In one popular version of the creation myth of Chitragupta, it is said that Lord Brahma gave the land of the dead over to the god Yama, also known as Dharamraj or Yamraj. Yama would become confused sometimes when dead souls would come to him, and would occasionally send the wrong souls to either heaven or hell. Lord Brahma commanded him to keep better track of everyone, and Yama declared that he could not reasonably be expected to keep track of the many people born of the eighty-four different life forms in the three worlds. Lord Brahma, determined to solve this problem for Yama, sat in meditation for many thousands of years. Finally he opened his eyes, and a man stood before him with a pen and paper. As Chitragupta was born of Lord Brahma’s body, or kaya in Sanskrit, Brahma declared that his children would forever be known as Kayasthas. As he was first conceived in Brahma’s mind, or chitra, and then made whole in secrecy, or gupta, away from the other gods, he was named Chitragupta. Chitragupt Puja festival is performed by Kayastha Parivar that believes in world peace, justice, knowledge and literacy, the four primary virtues depicted by the form of Shree Chitraguptjee. The puja is also known as Dawat (Inkpot) Puja, in which the books and pen are worshipped, symbolizing the importance of study in the life of a Kayastha. During the Chitragupt Puja, earning members of the also give account of their earning, writing to Chitragupt Maharaj the additional amount of money that is required to run the household, next year. There was a tyrant king who was always involved in sinful activities. One day, he saw few people observing this festival he also decided to perform the same. In his records, where he was marked as gatayu (whose life is over), the records shown that he was nor shatayu (one whose life is of hundred years). Thus, performing once this puja, that king was rewarded. There are other stories Saudas where he was immensely benefited by performing this puja. Masibhajan sanyuktacharsi twam mahitale. Lekhi katini hast chitragupt namostute. chitragupta namastubhyam lekhakshardayakam, kayastha jatimasadya chitragupt namostute. He had two wives, Iravati and Sudakhina. He had twelve sons who later formed the twelve subdivisions of kayasthas. His sons are Shrivastava, Mathur, Gaur, Nigam, Ashthana, Kulshrestha, Suryadwaja, Bhatnagar, Ambastha, Saxena, Karana and Vaalmik. There was a king whose name was Saudas . King was unjust and tyrant . He did not ever had the good deed . One day, he was wandering in the wilderness . He saw a Brahmin who was worshiping . Out of curiosity he asked the Brahmin that whom we was praying. 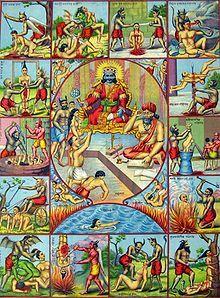 The Brahmin replied that today is Kartik Shukla’s second day and I am worshiping Yamraj (God of death) and Chitragupta (His bookkeeper) . Their worship is supposed to provide salvation from hell . After hearing this, Saudas also followed the rituals and performed the worship. Later, when his time was complete, messengers of god came to earth and took him to God Yamaraj. He was produced before in his court. When his books were examined by Chitragupta, and he told to Yamaraj – Though he is sinful and tyrant, but he has performed yours and my worshsip with proper rituals, hence he cannot be sent to hell. His place is in heaven. Thus by performing only one day of puja, he was absolved of his sins. I would like to share with my kids. Om Sri Chitraguptaye namah !